Is a regularly groomed dog a happier and healthier dog? We at Woodland West think so. Besides the eye-pleasing image of a freshly-groomed dog, professional grooming offers dog owners helping hands in maintaining the health of their beloved animal. While providing grooming services, our professional groomer examines pets from nose to tail, alerting the owner of any potential problems. Pets are blown dry, brushed, sprayed with designer perfume and topped with bows and a bandanna. Before and After pictures of one of our satisfied clients. Harmony has been with Woodland West since 2012, she has been grooming for 9 years. Her favorite breeds to groom are long legged terriers. She has four dogs, one goat, lots of chickens, and a cat at home. She enjoys showing Italian Greyhounds with her son Toby and is an active trainer for service dogs. 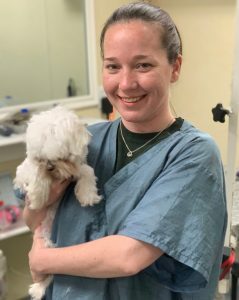 Amy has been grooming dogs for 16 years with 10 of those years being at Woodland West Pet Resort. Amy can groom any breed of dog and loves to pamper all of the pets on their spa day with her.